Click HERE for Sister City Campaign Center(US)! Let’s show Korea’s Sister Cities the truth about the dog and cat meat trades – and ask them to take action. Sister City Agreements are formed between two cities with the aim of being mutually beneficial (for trade, cultural exchanges, business links etc., and to foster friendship), and many cities across the world have such ‘twin cities’ all over South Korea. Different cities may have different strategies outlined for their twinning scheme – some are quoted as offering the benefits of: “community, school and youth links (for joint projects and cultural exchange” and “providing advice on Korean language, cultural considerations and business practices”. ‘Cultural’ benefits, therefore, are an important element in a twinning venture, which is why we wish to bring the unacceptable practices of the dog and cat meat trades to the attention of those City Mayors, and their Offices, twinned with cities in South Korea. We strongly believe that, however beneficial these sister/friendship city links are, it cannot simply be all about “taking the good, and ignoring the bad”, or only sharing ‘suitable’ cultural experiences. There must surely be some social responsibility for the representatives of one city to take a stand against any wrongdoing being sanctioned or ignored by their Sister City: in this case the illegal and aberrant dog and cat meat trades in South Korea. So, let’s urge these international City Mayors, in the spirit of friendship and for the good of the Korean people, to reach out to their counterparts in South Korea, asking them to enforce their laws and to put an end to the cruel dog and cat meat trades. Click on the hyperlink in blue to take action. We will continue to create more Sister/Friendship City Campaigns so check back on this page regularly. Thank you! 14 Jeollabuk-do Jeonju Italy Florence, Toscana Province 2007-3-28 Friendship City 6/9/2016 7/27/2018. Victory! Jeonju is officially going “Dog Meat Free”., 3/28/2018. Jeonju established dept for animal welfare master plan. 30 Gyeonggi-do Gapyeong-gun Canada Brampton, Ontario 2005-09-22 Friendship City 7/30/2017 4/23/2018, Brampton decided to end Sister City agreements. 36 Jeollanam-do Yeosu Canada Moncton, New Brunswick 2007-12-06 Friendship City 7/30/2017 8/9/2017 Response from Yeosu. 49 Daejeon Australia Brisbane, Queensland 2002-06-17 Sister City 9/18/2017 9/20/2017 Councillors Johnston, Sri respond, 9/29/2017 Lord Mayor’s Office responds. 53 Gyeonggi-do Paju Australia Toowoomba City, Queensland 2002-10-01 Sister City 8/1/2017 8/2/2017. Disappointing response. 57 Chungcheongnam-do Australia South Australia 1999-10-12 Sister City 5/22/2015 1/27/2016. Disappointing response from South Australia. 61 Gyeongsangnam-do Goseong-gun Australia Blue Mountains, New South Wales 2007-09-03 Friendship City 10/12/2017 10/12/2017 No Friendship City Agreement. 68 Busan Namgu Australia Latrobe, Victoria 2016-11-06 Friendship 9/8/2017 10/5/2017 Latrobe not Friendship City with Busan Nam-gu. 71 Gangwon-do Hongcheon-gun France Sanary-sur-Mer Commune, Provence-Alpes-Cote d’Azur Region 1991-10-12 Sister 3/20/2018 3/27/2018, Sister City inactive. 79 Gyeonggi-do Osan Finland Espoo 2017-10-24 Friendship 4/20/2018 4/28/2018, Espoo is not officially Friendship City with Osan. 81 Chungcheongnam-do Asan Finland Oulu, Northern Ostrobothnia Region 2010-03-30 Friendship Oulu city Head of Public Relations confirmed-No connection to South Korea. 4/17/2018. Video: Busan KAPCA(Korea Alliance for the Prevention of Animal Cruelty). 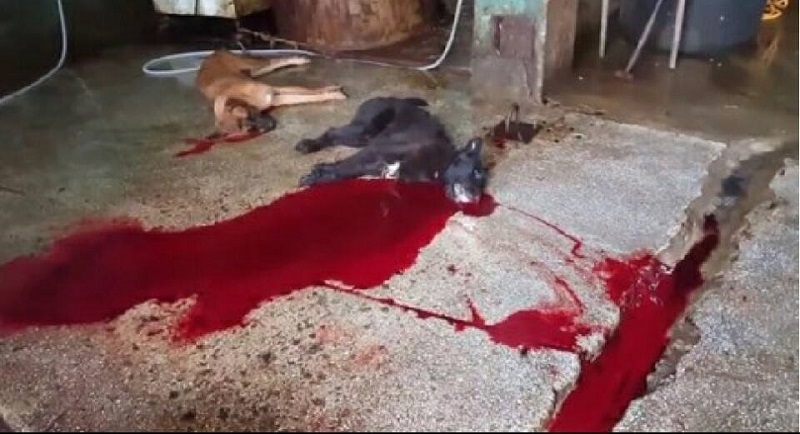 Illegal dog slaughterhouse in Ulsan, South Korea. Agree! This shpuld be made illegal. Shame on all who abuse animals especially torture them . Disgraceful!! Stop this Cruelty right now. You have to stop this right now! They are our best FRIENDS with the same feelings of pain! it so awful that I have no words to say what I feel !! I boycott all products made by these countries and will never visit them !! End dog and cat meat trades! END THIS MISERY ONCE AND FOR ALL!!!!!! THESE MANIACS ARE SICK!!!!!!! Boiling lives dogs.skinning live dogs .torching live dogs..putting these animals on bar b q Pitts alive..none human.please stop . The scum that do this need to have the same treatment done to them. Korea is now taking the killing of the dogs out of site from the people and away from the meat markets so that foreigners and locals can not see anymore what is really going on. This is a real setback because now nobody will know what attocities wil be done to the dogs. It is better to be for everyone to see instead of hiding this gruesome way of treating animals by boiling them alive and horrendous transport. Spokane Mayor David Condon: Please respond with plan of action as did the Shoreline, Washington Mayor Chris Roberts (http://koreandogs.org/shoreline-responds/) and many other cities. Thank you to the Spokesman Review for their coverage of this issue – Thousands of cats are also slaughtered for soups and “health” AND “MANLY PERFORMANCES” tonics in SOUTH KOREA. Boycott PyeongChang 2018 Winter Olympics in South Korea, A DOG AND CAT EATING NATION. Some of the most pathetic, mentally ill, heartless, sadistic humans on earth! Their evil, barbaric cruelty must be stopped, immediately! Poor, intelligent, gentle creatures! Stop this cruelty right now! stop this creulty now !! this animals are our best friends !!!! This is CRUEL, INHUMANE and BARBARIC. I don’t care what culture practices are….you DO NOT DO THIS TO AN ANIMAL PERIOD !!!!!! This has GOT TO STOP !!!!! These people are beyond barbaric! How could they be so cruel?? Would never support these people in anything they do unless their treatment of animals improves dramatically!! Unconscionable & morally reprehensible. The world is watching! Stop torturing & consuming dogs & cats!! You are all cruel, evil, barbaric cowards to treat animal beings like this. Karmic justice will come to you and you deserve it. Stop the Brutality towards these innocent poor souls the Whole World is watching and your country’s that are committing this crime are being hated and seen as wicked evil and vile stop this now . Arrêter ça ce geste barbare et sauvage. Stop this barbaric cruelty. It is evil, as are those that would perpetrate this heinous act toward an innocent animal. It seems that many still live in the Dark Ages. There is never any excuse for cruelty of this extreme nature. Poverty, ignorance, culture, non of these excuses will do. These crimes can never be washed away. It is way past time that humanity became humane and realised that all members of this planet are sentient. Animals are alive too and deserve our respect and kindness. These so called humans will steal and torture and then eat people’s pets,why is this allowed to continue? the whole lot of those filthy infested so called markets need to be burnt to the ground,with any luck it might get rid of the parasites walking around on two legs,it is obvious the leaders of these filthy holes have no control over anything,all they think about is lining their own pockets. This is disgusting get real into the 21st century Korea stop this if you want people to respect your country not think your centuries behind others. Please start more campaigns in France – I live close to Megève and am happy to provide information required for a petition to that town. Stop this medieval horror. It is not the action of educated people. Ma questi sono esseri umani ??? Non compriamo prodotti coreani. Se la Samsung, la LG, ecc. vedessero ridurre le vendite ed i profitti, che sono l’unica cosa che li interessi, sicuramente farebbero pressioni sul governo perchè ponga fine a questo scempio !! Finally stops torturing the dogs, it’s no longer sustainable!!! BARBARIC STOP THIS AWFUL FESTIVAL WHAT PLANET ARE YOU FROM?